SMS notifications allow you to deliver contextual and time-sensitive information to your app users. Did you know text messages have a 98% open rate and are read within the first three minutes? Use them to reach users with time-bound information – whether they have your app installed or not. SMS notifications are ideal for reaching a broad audience, getting users to respond, or notifying them of time-sensitive offers and delivery estimates. When you communicate via SMS, you’re sending messages to customers who opted in and want to hear from you. Use CleverTap to create campaigns based on a user’s action or inaction. 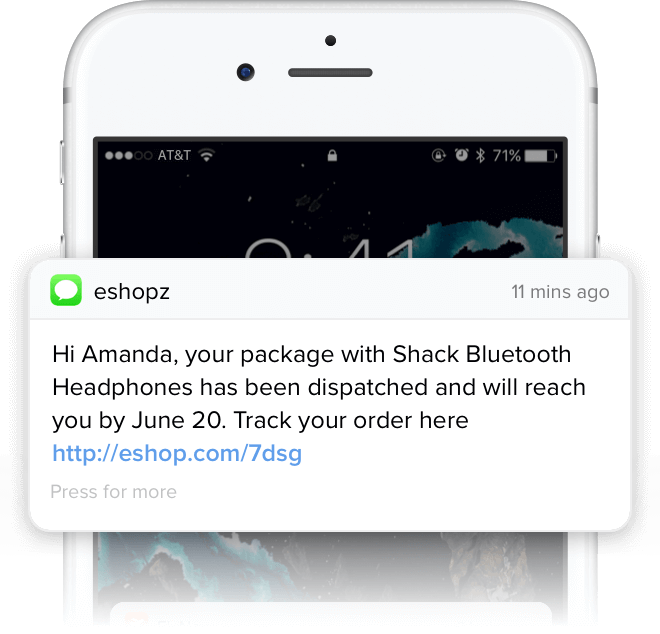 Sending an SMS notification when a delivery is arriving or when an item is ready for the user to pick up keeps your customers informed, giving them the peace of mind that you’re taking care of business. Because CleverTap can process billions of events in a fraction of a second, you can send text messages customized to each user segment and reach billions of users instantly. All without breaking a sweat. As a marketer, you want to make sure you reach your users at the most optimal time for your campaign to be effective. CleverTap offers the ability to stagger a campaign so that you can send it based on a specific time in your users’ local timezone. CleverTap supports sending SMS notifications to your users through partnerships with many popular SMS providers, including: Twilio, Exotel, Netcore, MSG91, TextLocal, Nimbus SMS, Plivo, BulkSMS, and SMSINDIAHUB.